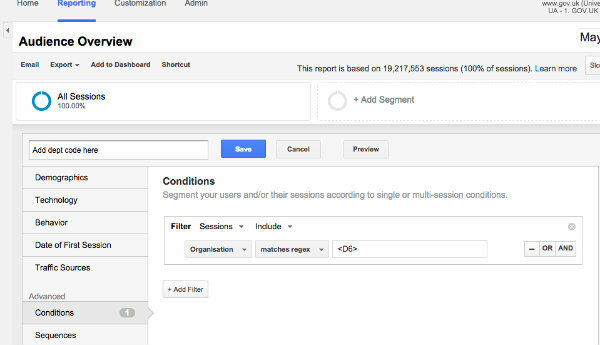 Last year, Google released the enhanced version of Google Analytics, Universal Analytics. We’ve been running the Universal Analytics code in parallel with classic Google Analytics to test data accuracy. We’re happy with it and so we'll now switch the GOV.UK account to the Universal Analytics collector. The switchover will happen on Tuesday 2 June 2015. Universal Analytics includes new features, which we will be exploring later in the year. It provides enhanced ways of understanding how users interact with GOV.UK. If we don't upgrade, we won't benefit from any new development and the classic version will stop collecting new data in 2016. (Historic data will still be available). Most GDS Google Analytics users won’t need to do anything - the user interface will stay the same and historic data will still be accessible. Department and agency users will need to change the way they filter to get an organisation view. After we switch, custom variables will not collect any new data. You’ll need to create equivalent filters using custom dimensions. This will affect any users with a custom dashboard, report or segment, and may affect scheduled reports sent to colleagues. The Performance Platform will be updated to use the collect data from the custom dimension filters, so the platform’s web traffic dashboards will continue to display data. Most metrics in Universal Analytics will be very close to the ‘classic’ figures. However, there is a different ‘rule’ for when a new session is recorded. In ‘classic’ Google Analytics, if a user left GOV.UK, but returned within the standard 30-minute window, this would be seen as the same session. Universal Analytics always starts a new session from any referral, even if the user had already made a visit to GOV.UK within the last 30 minutes. So you'll likely see a small increase in the session (visit) count. The average session duration will also reduce. We’ve set up a new community on Basecamp, GOV.UK Performance Analytics, and have invited all our analysis contacts in departments and agencies to join. We'll be posting everything you need to know on Basecamp, and if you have any questions, please post them there. We’re preparing a series of short videos (under a minute each) and illustrated documents to walk you through what you'll need to do once we have upgraded to Universal Analytics. For most users, this will be simple and straightforward, taking only a few minutes. We’ll provide support via drop-in, telephone or Hangout at specified times once we have completed the upgrade. The GOV.UK Performance Analytics Basecamp is the best place to find out what you need to do, get help and find out about the clinics. We think we've invited everybody we should, but let us know if you cannot access it.